where you can also join Cappy as a friend by clicking the Google Friends Connect button on the right hand side of the blog post. This is an absolute must visit! and I definitely recommend joining Cappy as a friend…so all you dog lovers out there please rally around and ask your friends to drop by. 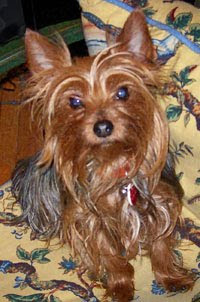 I am a 6 year old Yorkshire terrier from London, England. My Great Great Great Grandfather was from Yorkshire England which is very north of the country. I was born in the city proper, a town called Chelsea also better knows to you Americans as Kensington. When my mother was recovering from breast cancer, she told my father that she had to come to London to get me. I was just a little less than a pound and my mum and I got on a very large, what I know now, is an airplane. I didn’t know it then, but I do know now after many transatlantic flights. We are a family that travels quite a lot. When I first got home, I was quickly introduced to my two new brothers. My oldest brother, Governor, the black lab, may God rest his soul, and Senator, the chocolate lab. It wasn’t until some years later when Governor went up to be our guardian angel that our Little Man chihuahua, who speaks Spanish and we have a little a language problem because I speak the Queens tongue. Nonetheless, we have a great time swimming in the ocean and in the pool. I hear my mum often telling people that the Labradors have webbed feet and are supposed to swim, but that I and Little Man are not supposed to swim, but are supposed to sink as we don’t have webbed feet. But let me tell you, that we live to swim and we love to go on Papa’s yacht. Every summer, we go back East to Grandmother and Grandfathers home in the Hamptons. We spend the entire month of August there. Lucky for me, I get to fly with Mum in the cabin as always. Poor Senny, he loves his crate, but he seems to go somewhere else. He tells me it’s quite comfortable but is loud and has a hum to it. He says it doesn’t matter because he knows where he is going and he is going to the beach for a month and nothing could be finer than to be living at the beach for one month. And let me just tell you that Grandmother and Grandfather have two Labradors, Chloe and Luke, that we love to play with and our Tata Liz has a poodle named Rupert that loves to swim and go on the yacht with us too. I love the name ^_^!! Suits him well! Hi!Very nice dog! :)Welcame visit my blog.